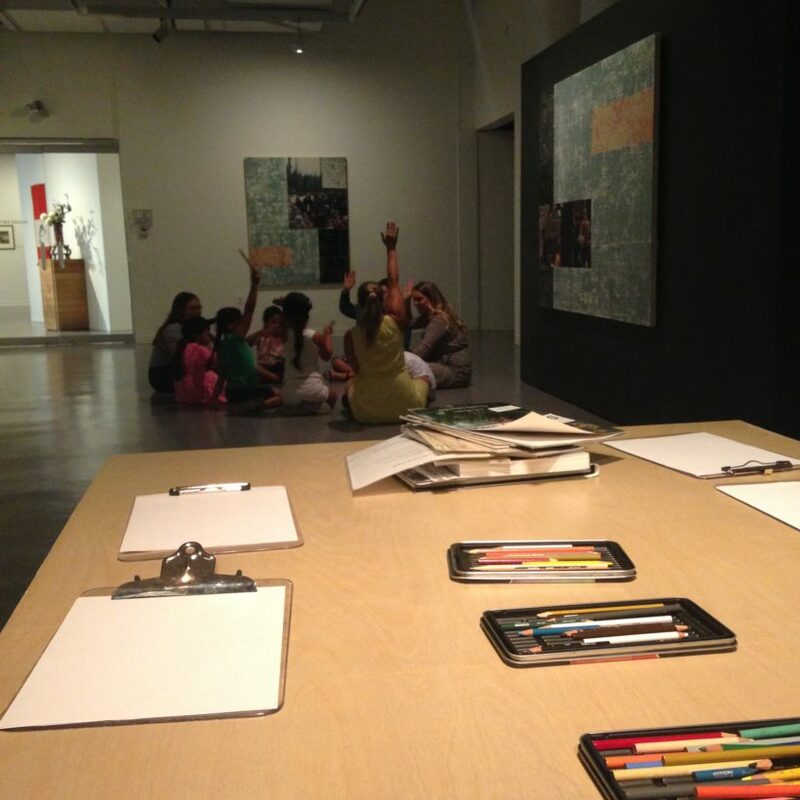 In early August the Gallery had the pleasure of exploring the Supernatural: Art, Technology and the Forest exhibition with young learners (K-Grade 5) from SENĆOŦEN LE,NOṈET SCUL,ÁUTW̱ Survival School. It was both the children and their teachers first time ever visiting the Gallery. Summer Institute students developed a deeper understanding of the impacts of settler colonialism on Indigenous peoples in Canada before visiting the Gallery. This supported the UVIC students in facilitating various hands-on, experiential, fun activities with the young learners in a mindful way. These students all have teaching practices at various schools across Canada and Denmark, and are thinking deeply about how to teach in ways that are supportive, empowering, respectful, holistic and nurturing for young ones from Indigenous and various cultural backgrounds. 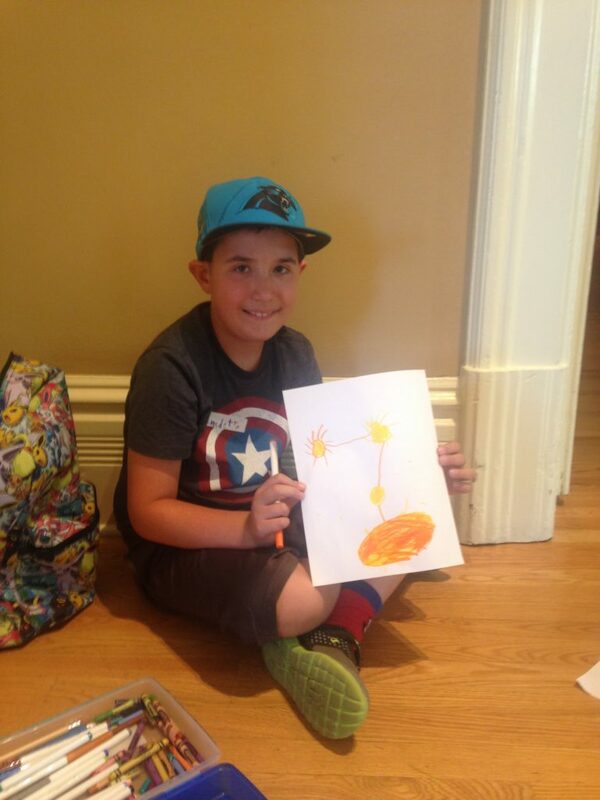 Featured above: An inspiring young leader sharing his drawing. Thank you to UVIC Indigenous Education professors Dr. Carmen Rodriguez de France, Dr. Anita Prest, visiting professors from Denmark, UVIC students, Jacqueline Jim, teachers and bus driver from LE,NOṈET for this partnership and all of the good energy you brought to the process. And of course to all of the LE,NOṈET young ones…we were truly inspired by learning with you! *SENĆOŦEN LE,NOṈET SCUL,ÁUTW̱ Survival School website. As part of the AGGV’s ongoing learning around how to be a place where more and more people feel welcome, admission is complementary for Indigenous peoples. Feature top image: UVIC Indigenous Education Summer Institute students with LE,NOṈET young ones in Supernatural: Art, Technology and the Forest. ← What’s to Love on Fabulous Fort?